The Brooklyn Gentleman’s Chest is just one example of hundreds of bedroom options available. All our Amish-made dressers, chests, and nightstands are heirloom-quality and solid-wood that is handcrafted by highly skilled woodworkers. They are available in a variety of styles and timeless designs that match any decor. Dove-tail jointed drawers with extremely smooth extended glides give you full access and added strength for convenient storage capability. You customize the look with options including your choice of wood, finish and hardware. Each piece of furniture is exclusively built just for you using the highest quality materials to last for generations. The term “Amish Furniture” brings to mind fine craftsmanship and heirloom quality, but not all Amish furniture is the same. At Herron’s, we have been forging relationships with our Amish builders for more than 20 years- choosing only the cream of the crop, the best of the best, to sell to our customers. The Cabin Creek Wide 3 Drawer Nightstand is just one example of hundreds of bedroom options available. All our Amish-made dressers, chests, and nightstands are heirloom-quality and solid-wood that is handcrafted by highly skilled woodworkers. They are available in a variety of styles and timeless designs that match any decor. Dove-tail jointed drawers with extremely smooth extended glides give you full access and added strength for convenient storage capability. You customize the look with options including your choice of wood, finish and hardware. Each piece of furniture is exclusively built just for you using the highest quality materials to last for generations. The term “Amish Furniture” brings to mind fine craftsmanship and heirloom quality, but not all Amish furniture is the same. At Herron’s, we have been forging relationships with our Amish builders for more than 20 years- choosing only the cream of the crop, the best of the best, to sell to our customers. The Cabin Creek 5 Drawer Chest is just one example of hundreds of bedroom options available. All our Amish-made dressers, chests, and nightstands are heirloom-quality and solid-wood that is handcrafted by highly skilled woodworkers. They are available in a variety of styles and timeless designs that match any decor. Dove-tail jointed drawers with extremely smooth extended glides give you full access and added strength for convenient storage capability. You customize the look with options including your choice of wood, finish and hardware. Each piece of furniture is exclusively built just for you using the highest quality materials to last for generations. The term “Amish Furniture” brings to mind fine craftsmanship and heirloom quality, but not all Amish furniture is the same. At Herron’s, we have been forging relationships with our Amish builders for more than 20 years- choosing only the cream of the crop, the best of the best, to sell to our customers. 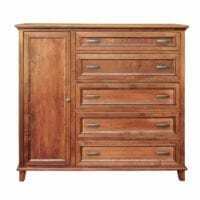 The Cabin Creek 7 Drawer Highboy Dresser is just one example of hundreds of bedroom options available. All our Amish-made dressers, chests, and nightstands are heirloom-quality and solid-wood that is handcrafted by highly skilled woodworkers. They are available in a variety of styles and timeless designs that match any decor. Dove-tail jointed drawers with extremely smooth extended glides give you full access and added strength for convenient storage capability. You customize the look with options including your choice of wood, finish and hardware. Each piece of furniture is exclusively built just for you using the highest quality materials to last for generations.